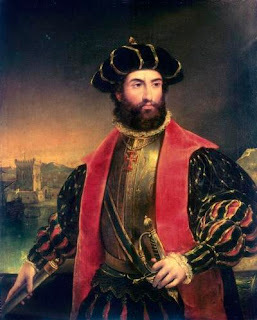 I, Vasco Da Gama, was born in 1460, in Sines, on the Southwest coast of Portugal, in a house near the church of Nossa Senhora das salas. Sines, one of the few seaports on the Alentejo coast, consisted of little more than a cluster of white-washed, red-tiled cottages, tenanted chiefly by fisherfolk. My father was Estevao da Gama. In the 1460s he was a knight in the household of the Duke of Viseu. Being appointed Civil Governor, he was able to receive a small revenue from taxes on soap making in Estremoz. My father, Estevao was married to Dona Isabel Sodre, my mother, who was of English origin. I studied at the inland town of Evora, where I learnt mathematics and the famous astronomer Abraham Zacuto. In 1942, King Jaun Paul II of Portugal sent me to the port of Setubal, south of Lisbon to seize French ships in retaliation for peacetime depredations against Portuguese shipping- a task that I performed rapidly and effectively.